Firefox and Internet Explorer recommended for downloading documents. To use Chrome, go to Chrome Settings>Advanced>Content Settings>PDF Documents and check the box to download PDFs. Sort each of the first 3 columns alphabetically (or by date) by clicking on the column header. Once you find the project you are looking for, click on any of the Public Documents, or click on the Project Title to see the rest of the Bid Documents for the project. You will be prompted to login/register for that project. 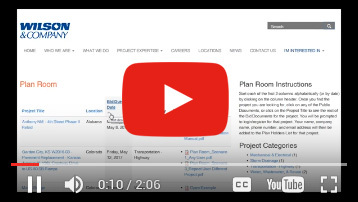 Your name, company name, phone number, and email address will then be added to the Plan Holders List for that project.